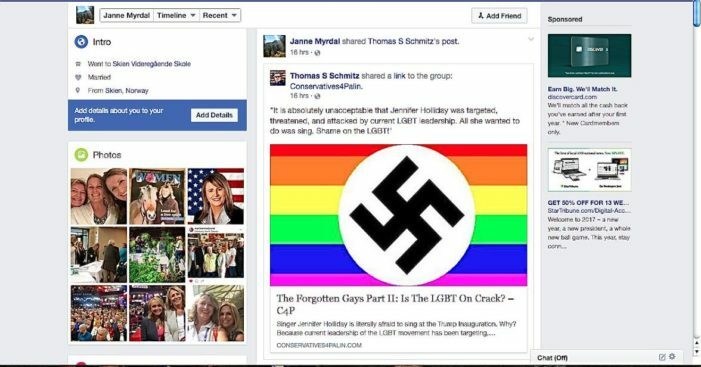 North Dakota Senator Janne Myrdal caught flak for sharing an image of a gay Nazi flag on Facebook. A screenshot of Sen. Myrdal’s page via Mean Read. The flag was shared along with an article titled, “The Forgotten Gays Part II: Is the LGBT On Crack?” According to the story, gay people are like Nazis. According to history, the Nazis put gay people in concentration camps. After people criticized her for it, Myrdal took the post down and put up an apology, claiming it was an accident. Maybe the image was an accident, but the loathsome, homophobic sentiment behind it was genuine.